"This cotton candy is the bomb! The price is great. The flavors are great. The zip lock packs are great. No complaints. I'm happy with my purchase. | "Hand-spun cotton candy takes us back to our childhood. Would highly recommend this cotton candy pack to anyone!" 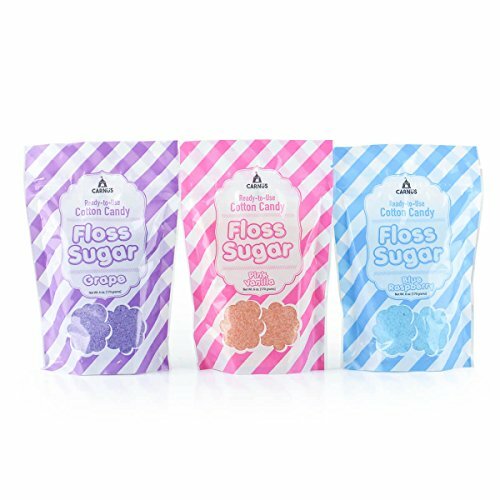 It's party-time any time with the Carnüs brand Cotton Candy 3 flavor floss sugar pack. Don't wait in line at the carnival to pay inflated prices on cotton candy. Hand-spin delicious, fluffy, mouth-watering cotton candy from the comfort of your own home with this pack. Simply pair this kit with your favorite cotton candy maker and enjoy the sweet confection of cotton candy. Your taste buds will thank you! These three cotton candy flavors have long been the top sellers at carnivals and state fairs. The classic favorites of Pink Vanilla, Blue Raspberry, and Grape don't only appeal to the youngsters, but to adults too. This pack is convenient for use with both commercial and household cotton candy makers! CUSTOMERS SAY: "You can't beat this price! I shopped around hoping to find something of quality and I'm sure glad I did. This sugar makes the best tasting cotton candy and I didn't have to leave the house!" If you have any questions about this product by Carnüs, contact us by completing and submitting the form below. If you are looking for a specif part number, please include it with your message.